No other dish comes close to the excitement and flair of a hot skillet of fajitas served for hungry guests. The aroma, sizzle and spice create a memorable experience that is perfect for just about any occasion – indoors or out. 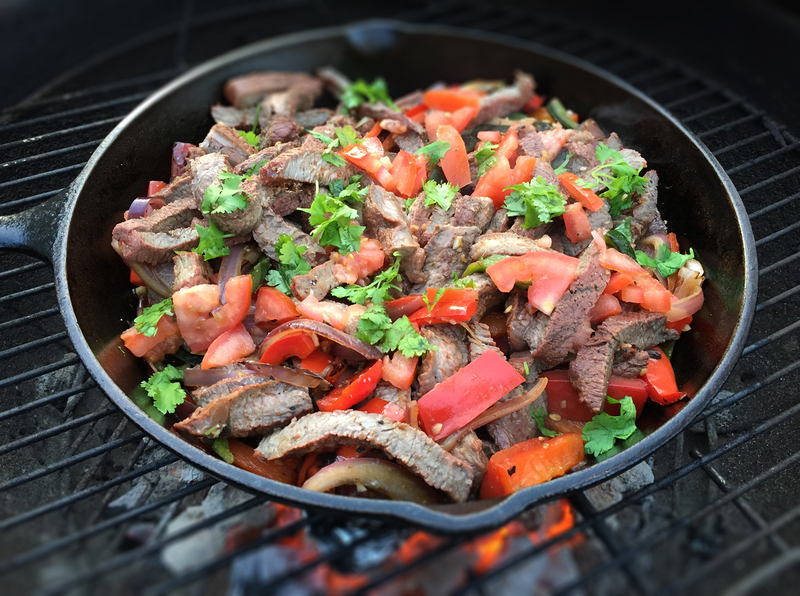 Fajitas are an Americanized version of Mexican flank steak (faja meaning “belt”.) Texans would probably like to lay claim to the fajita, but history gives credit to Mexican ranch workers living in West Texas along the Rio Grande on the Texas-Mexico border in the late 1930s or early 1940s. When a steer was butchered, the workers were given the least desirable parts to eat for partial payment of their wages. Because of this, the workers learned to make good use of a tough cut of beef known as skirt steak. The fajita is truly Tex-Mex cuisine (a blending of Texas cowboy and Mexican panchero foods). The Mexican term for grilled skirt steak is arracheras, and its American counterpart is fajitas. Today, the term fajita has completely lost its original meaning and has come to describe just about anything that is cooked and served rolled up in a soft flour tortilla. The only true fajitas, however, are made from skirt steak — and with that bit of history, enjoy the recipe. I’ve tweaked and niggled it for over ten years. Aggressively pierce the flank steak with a needle tenderizer on both sides, sprinkle generously with rub (working it in with your fingers) and place in large ziplock bag. Mix the marinade ingredients well in a bowl and add to the bag. DO NOT SLICE UP THE STEAK AT THIS POINT. YOU WILL DO THIS AFTER YOU GRILL IT. Coat well, remove the air and place the sealed bag in the fridge for at least four hours, but preferably overnight. Rotate occasionally. Prepare your mesquite chips for the grill by either soaking them in water for a couple hours OR by placing them dry in a wrapped aluminum foil packet with several holes punched in the side. Either method works well. If you cannot find mesquite chips you can also use hickory. When ready to grill, cut up your vegetables and set aside so you don’t have to rush everything at once. Prepare the grill with real wood charcoal; when they turn white, throw on the mesquite chips. Sprinkle a little more fajita rub on each side of the steak. Grill until it is medium-rare, 7-10 minutes. YOU WILL FINISH COOKING THE STEAK IN THE PAN, so don’t worry if it’s a tad pink or even red. This is a good thing. Remove the steak from the grill and set aside on a cutting board for FIVE MINUTES. This step is critical, as the juices of the steak will draw back into the meat. If you cut it immediately, it would dry out and be tough. Restoke the charcoal, if necessary. Bring a large, well-seasoned cast-iron pan up to HIGH heat. There really is no substitute for cast-iron with this recipe. The intense heat will warp or burn the non-stick coating off all other pans. I also don’t like using the smaller fajita-style pans like restaurants use, as they are ridiculously small for a family-sized portion prepared in one easy batch. I prefer to place the pan directly on the outdoor charcoal grilling grate. Add about two tbs. of olive oil to the pan and sear the onion and peppers until slightly blackened. Stir once and add the garlic. Using a very sharp chef knife, quickly slice up the meat in 1/4″ strips at a bias, ensuring the cuts are perpendicular to the grain of the meat. Add to the pan and stir once. Top with chopped tomato and lightly salt. Add the cilantro leaves and drizzle with lime juice. Remove from heat immediately and serve on tortilla shells with guacamole and your choice of salsa. Don’t fret if you didn’t get it right the first time. This recipe is a lot of work and requires split-second timing during the cooking process. Practice makes perfect and you will ascend to grilling guru status in no time! 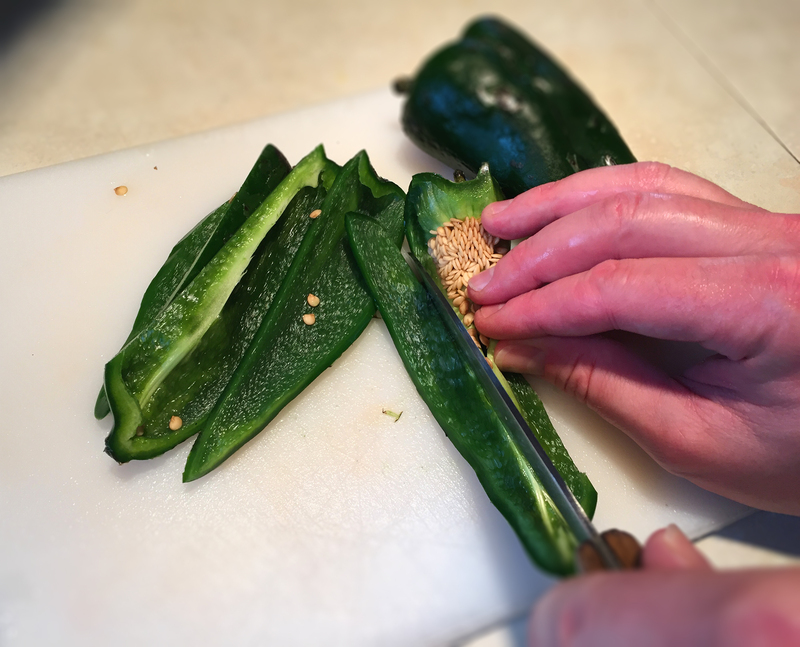 Preparing the roasted poblano peppers. 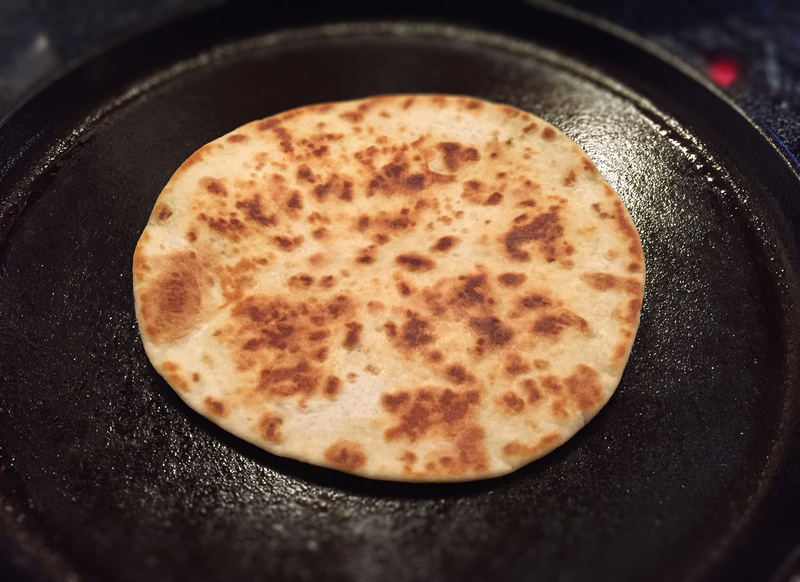 Toasting flour tortillas over a cast-iron comal. Roasting poblano peppers with a propane torch. The tough outer skin is unpalatable and should be removed before baking.